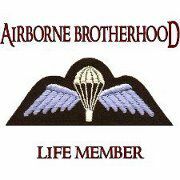 Parachute Regimental Association are an ex serviceman's group for ex members of the Parachute Regiment and Airborne Forces. The branch have been in existence since 1947. Holds meetings based on the Parachute Regimental Association and include both the Sheffield and Rotherham areas. One meeting is an official meeting when PRA matters are discussed along with financial and welfare issues. The other is a social meeting and there are a number of guests who regularly join the events. Also organises trips into Europe for historical and remembrance events and have a close liaison with the Belgium Airborne Forces and the local people of Pleugg Steert on the French/Belgium border. Life membership is £7.50 with OAP concessions. When attending it must be understod that attendance will inevatably be in one of the rooms and then the Mess. As required those attending need to wear respectable clothes including a collar and Tie. Next Meeting Last Wednesday in the month. Last Wednesday in the month at 7.30pm for 8:00pm (official meeting) then at times of attending agreed events. We also have a mid monthly Social gathering usuially a 2p.m. one Saturday as agreed at the meeting. 2pm for mid month Saturday Social Gathering. Formed at the end of WW2, the Parachute Regimental Association aimed to allow those that had served on joint operations an opportunity to continue the close bond they had developed. The following years of conflict that encompassed Aden, the Falklands, NI, Iraq and Afghanistan have seen these links continue to this day. Membership of the Parachute Regimental Association is available to all those who have served with the Parachute Regiment or Airborne Forces, their wives and families.